On the Tuffalm, hikers may enjoy delicious plates like speck platter or Kaiserschmarren (sugared pancake with raisins). Our menu offers many Tyrolean meals like different kind of dumplings: speck dumplings, cheese dumplings, spinach dumplings. On request, we also serve special dishes in the evenings. Our professional cooking team only presents you the best dishes from the South Tyrolean cuisine, prepared with pure, natural and regional products and ingredients. 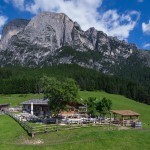 All guest are kindly welcomed to our cosy restaurant with a wonderful view on the surrounding mountains. A hiking tour through the mountain world of South Tyrol is completed with a visit to a rustic alpine hut and a traditional meal.